Kaitlyn Weaver and Andrew Poje believe they have the best of both worlds. The ice dancers soaked up the show tour environment in two gruelling months spent on the cross-country Thank You Canada Tour. And they have the technical savvy that's earned them three world championship medals in their dozen years together. On Friday night, they were the proverbial full package, winning the short dance at the Canadian figure skating championships in their first competition in four months. "This week we're here just to show ourselves, we're having fun showing off, if you will," Weaver said. "We've worked so hard, we have so much experience in front of audiences, and we've done our homework with the technical rules and now we get to let it loose with no worries. This is a great start for us." The skaters from Waterloo, Ont., scored 85.19 points for their sizzling skate to "Libertango." Skating to please a panel of judges once again was a "little bit different," Poje said. "When you're out there in the show, you have thousands of judges that you try to express to everyone on every side, and try to pick your moments, whereas this one you're trying to just be in your moment and try to really show the entire program to the best of your ability." Piper Gilles and Paul Poirier are second (83.08). 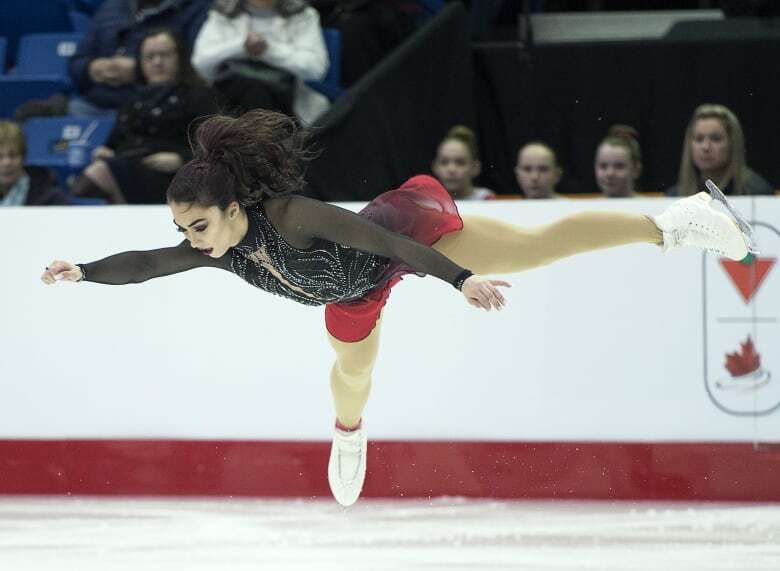 Gabrielle Daleman is the leader after the women's short program, her first event since taking a break to focus on her mental health. And Kirsten Moore-Towers and Michael Marinaro won the pairs short program. Weaver and Poje have skated in the shadow of two-time Olympic champions Tessa Virtue and Scott Moir for virtually their entire career. But on Friday, Weaver, dressed in a gauzy rose-gold dress, and Poje in a shirt, vest, and black slacks, enchanted the crowd at Harbour Station arena with their sizzling tango. Having only to focus on two performances this week is a welcome break from the Thank You tour grind that saw them do 28 shows across Canada. "There were moments we were just exhausted," Weaver said. "But we always came out the other side thinking 'You know what? We're doing this for a reason, and that's to learn from all of it' . . . for ourselves it was something to push through and enjoy at the same time." Weaver and Poje are poised to capture their third Canadian title. They've been perennial runners-up to Virtue and Moir, capturing gold during Virtue and Moir's two-year hiatus. "We're not going to lie, obviously it would be amazing," Poje said. "But we're not here really for the medals. We wanted to go out there and show the work that we've done but also the love that we have for these programs, and how proud we are of each other and our team." They'll be pushed in Saturday's free dance by Gilles and Poirier, who edged Weaver and Poje for silver at last year's national championships, one of four silvers they've won at the event. Skating to "Angelica's Tango," Gilles and Poirier earned an appreciative roar from the crowd. The two joked that they slip into made-up characters for the tango. Gilles calls herself "Rosella." Poirier is "Guido." "It's really just the amount of training that we've done and the amount of thought that we've put behind this program," Poirier said on their solid skate. "Every day we come and in and try to think about our characters, and what we're trying to portray, what each moment means in the program. "I think over time we've come to learn every single nook and cranny of the program and allowed the characters to shine through everything that we're doing." Daleman, a 21-year-old from Newmarket, Ont., scored 70.18 points for her program to "Habanera," by Georges Bizet. The 2017 world bronze medallist and a two-time Canadian champion announced in October she was withdrawing from Skate Canada International to focus on her mental health. She also withdrew from her second Grand Prix assignment, the NHK Trophy in Japan, effectively ending her fall competition season. Larkyn Austman of Vancouver was second in the short program, scoring 64.53, while Veronik Mallet of Sept-Iles, Que., was third with 60.55. Skate Canada officials said earlier this week Daleman preferred not to speak to media until after Saturday's free program. She's been open in the past discussing her battles with an eating disorder and a learning disability. Daleman was part of the Canadian squad that won gold in the team event at the Pyeongchang Olympics. But she fell three times during a disastrous long program in the singles event and burst into tears when the music stopped.